Nowadays, any sense of the exotic evoked by a Fender Bass VI pales in comparison to how extraordinary Leo Fender’s electric instruments were upon their debut. Today, solidbody electric guitars and basses are so embedded in our psyche that it’s difficult to imagine where we might be without them, but prior to the 1950s, such technology was pretty revolutionary. It’s a wonder that Fender managed to create a demand for such striking innovations at all, let alone change the face of popular culture with them. All the same, some designs proved to be more of an acquired taste than others. 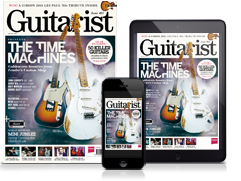 The solidbody electric guitar as we know it today evolved from its acoustic ancestors via several developmental steps that were intended to increase the audibility of the instrument within a band, while its bass counterparts evolved in parallel from upright, fretless basses in a similar vein. In the decade after Leo Fender introduced these groundbreaking guitars to the mass market - with the Esquire/ Broadcaster in 1950 and the Precision Bass in 1951 - he continued to expand the company’s catalogue and in 1960 released the Jazz Bass, which was followed shortly afterwards by the Fender Bass VI (often referred to as the ‘Bass Six’) in 1961. Sporting an offset body and floating vibrato system, the Bass VI is immediately reminiscent of Fender’s Jazzmaster, released a few years earlier in 1958, and came in sunburst with a tortoiseshell celluloid pickguard as standard, as well as a selection of custom colours. Three custom designed single coil pickups with individual polepieces housed in metal surrounds were selected via individual on/off switches located on the upper treble bout control plate, with further adjustment available on the control plate of the lower treble bout courtesy of master volume and master tone knobs positioned adjacent to the guitar’s front-loading jack input. With a one-piece bolt-on maple neck and a 7¼-inch radius, 21-fret rosewood fretboard, the Bass VI’s scale length measures 30 inches, between the Jazzmaster/Telecaster/Stratocaster scale length of 25½ inches and the Precision/ Jazz Bass scale length of 34 inches. Ordinarily tuned to E-A-D-G-B-E (from low to high) and pitched an octave lower than a regular six-string guitar, the Bass VI’s unique tension and string gauges give it a very specific feel and sound that may be described as more focused and defined than a regular bass, while exhibiting significantly greater punch and power than a conventional guitar. It remains a compelling and distinctive sonic experience. Danelectro’s baritone guitar had hit the market back in 1956, so the six-string bass was already a studio favourite in Nashville, where producers famously made use of its muted ‘tic-tac’ sound. Innovation was still possible, however, and in 1963, following the release of the Fender Jaguar, the Bass VI received a series of spec upgrades designed to accentuate this characteristic baritone sound, including a foam string mute, a fourth ‘strangle’ / bass-cut switch and ‘sawtooth’ Jaguar-style pickups. Discontinued in 1975, the Bass VI remains a unique piece of guitar history and although it was never a mainstream hit, it nonetheless managed to meet the distinguished approval of Jet Harris,Jack Bruce, John Entwhistle, John Lennon and George Harrison. L-prefixed five-digit serial number stamped onto metal neckplate. Matching ‘Pink Champagne Sparkle’ finish; gold “Fender VI” logo with ‘OFFSET Contour Body’ decal. ‘Mint green’ celluloid pickguard; 4x black plastic switches; 2x black plastic knobs; foam string mute; ABS vinyl pickup covers. Jazzmaster/Jaguar-style floating vibrato system; adjustable bridge with 6x individual saddles; ‘Fender Mute’ mechanism; 2x chrome control panels; single line Kluson tuners; single ‘butterfly’ string tree; 2x strap buttons; frontloading jack input. Jaguar-style single coil pickups with individual pole pieces and notched metal sidepieces; individual on/off switches; ‘strangle’/bass-cut switch; master volume and master tone pots. 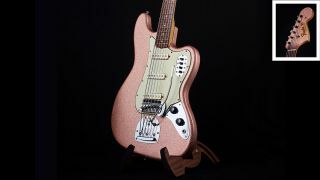 Offset Jazzmaster/Jaguarstyle alder body with ultra-rare original ‘Pink Champagne Sparkle’ true custom colour finish. Single-piece bolt-on maple neck; 21-fret veneer rosewood fretboard with ‘clay’ dot inlays and 7¼” radius; 30” scale length.